During our Power to the Pews series exploring guerrilla marketing we asked what kind of guerrilla marketing you’d do for your church. 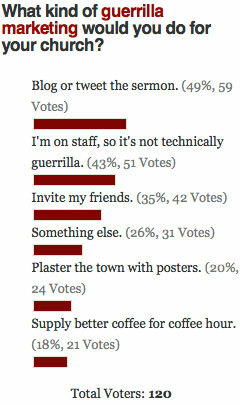 Multiple answers were allowed and the most popular answer with nearly 50% was blogging or tweeting the sermon. Next came inviting friends with 35% (vastly better than the 2% research shows; let’s see if we can actually do it!). 20% were willing to plaster the town with posters and 18% would go the extra mile by supplying better coffee (what truly matters). More than a quarter were willing to do “something else”. So tell us in the comments, what’s your “something else” to help promote your church? It’s also worth noting that 43% reported that they’re on staff at their church so they can’t technically do guerrilla marketing. Assuming the scientific accuracy of this poll (ha! ), that means a majority of our readers are sitting in the pews. Do you think we need to focus more on how parishioners can market their church and less on staff?